At Shopwaterfilter.com, we don't believe you should ever have to pay full price for the products and services you need and want. When saving money is your top priority, our online reward program will help you get the best prices possible on everything from refrigerator water replacement filters. You'll shop like a pro - and save more money than you ever thought possible on the products you love. At Shopwaterfilter.com, we know exactly how challenging staying on budget can be. That's why we want to make our online reward programs your go to source for savings, deals and opportunity. 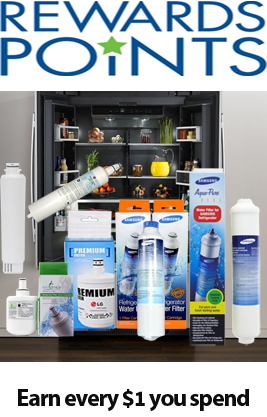 Join Shopwaterfilter.com, shop like a pro and find out how we make getting the products you want at the prices you need! 1) Earn 5,000 reward points ($5.00) for setting up your account. 2) Earn 1,000 reward points for every dollar you spend online. 3) Earn 5,000 reward points for signing up newsletter.